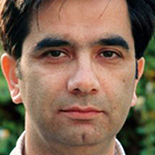 Reza Shirazi was born in Bombay and is Iranian by origin. He is included in two anthologies edited by Naomi Shihab Nye: The Space Between My Footsteps and What Have You Lost? and, most recently, in A World Between: Poems, Short Stories and Essays by Iranian Americans edited by Persis Karim. awakes slowly after a ten year sleep. in forgotten nooks and crannies. it finally tries to rise. on a wave of words.